BACE is the home of Loud & Proud Cheerleading in Glossop. Cheerleading is one of the UKs fastest growing sports with teams competing in regional and national events and the competition is fierce. Cheerleading is physically demanding with routines combining choreographed dance with gymnastics, jumps and stunts. It sets the tone for a lifestyle of healthy choices which is so vital in young people. Loud & Proud is successful and has a strong regional and national reputation. It prides itself on creating a supportive environment in which young athletes learn a range of skills. Cheerleaders have to work hard on their stamina, balance, strength, agility and flexibility. Being successful requires dedication, hard work and team spirit, but the rewards outweigh all the training, not only is it fun it also builds confidence, self esteem, self-belief and sportsmanship. The club’s structure is designed to nurture talent at all ages with a range of teams catering for boys and girls aged 4 -18+ years enabling members to make a long term commitment to the sport. It has a successful adult team, comprised largely of ‘cheer parents’ who, after being inspired by their children’s performances, demanded a team of their own. The most talented athletes can develop further in the teams that demand higher level skills. 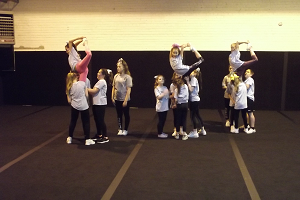 Finally, its leadership programme offers older athletes opportunities to coach teams, acting as positive and inspirational role models for young cheerleaders. Cheerleading undoubtedly teaches bonding and trust amongst team members but it also brings families of team members together. It is a sport that builds team spirit and a sense of community. If you want to be part of this successful team please check out Loud & Proud’s Facebook page and website.